The Rivers Nursery Site & Orchard Group website now has a downloadable version of my article on the progress made so far to fully document and record the orchard, all that remains of the once large horticultural site, Thomas Rivers Nurseries at Sawbridgeworth. A short version of this was published in Elizabeth Waugh’s recent book: Rivers Nursery of Sawbridgeworth: The Art of Practical Pomology, by Elizabeth Waugh, published by the Rivers Nursery Site & Orchard Group in association with Rockingham Press. This is a history of the renowned Nursery in Sawbridgeworth during its long residence from 1725 until the end of the twentieth century and includes the memories of horticultural practices by those who worked there. I am sure readers of this website know of this orchard; it has been widely reported in the press and is widely discussed in orchard circles, but still in limbo with its future, perhaps even its continued existence, undecided. There have been very many visitors, including the Royal Horticultural Society Fruit Group, East of England Apples and Orchards Project meetings, local events and festivities and lone walkers. 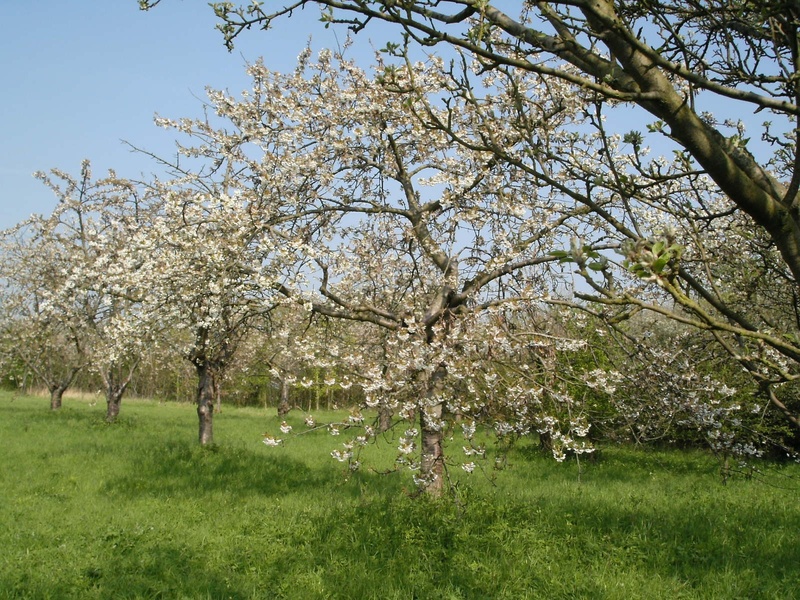 The orchard in flower is spectacular and in fruit is endlessly interesting with so many fruit varieties that, as a publicly accessible collection, it is perhaps only exceeded in diversity in Great Britain by the National Fruit Collection at Brogdale, and the Fruit Field at Wisley. An integral part of justifying its protection has been the huge task of identifying what was planted, as, unlike Wisley and Brogdale no records exist at all. The identification of fruit varieties on this scale is almost unprecedented, and a few statistics demonstrate this. Four hundred and thirteen trees from the original planting are still there, (and over 150 more have been planted since 1990). Most varieties are planted in small numbers as the orchard was a source of graft wood, and not for fruit production. There are 203 original apple trees representing about 50 varieties; of the 124 plum trees, over half have been identified (some only tentatively) leaving 56 still to be identified; there are 34 cherry trees so far unidentified … and so on. Identification is still in progress some four years after the programme commenced, but enough has been done to summarize the progress so far, so the article has to be considered as an interim report. Every tree is listed, whether of known variety or not and every one can located in the orchard from the tables. The main identifiers were Bob Lever, Martin Skipper, Sue Hutchinson and myself for apples, Michael Gardner and myself for plums. Pears and cherries are only just about to begin. One of my principal purposes in bringing this orchard to the attention of readers of this website is its vulnerability. It has been threatened by development, left to an active local group to defend, but largely ignored by local government and to some extent subjected to inaccurate statements about its importance, its legal status and what legal structures can be applied to it. I am hoping that this article will put it back on the map. It is a large traditional orchard, as defined by Joint National Conservation Committee (JNCC). It should be given a Tree Preservation Order (TPO), plus County Wildlife Site status, and in every sense of the word treasured. Well, Rivers Nursery Orchard is just that too! 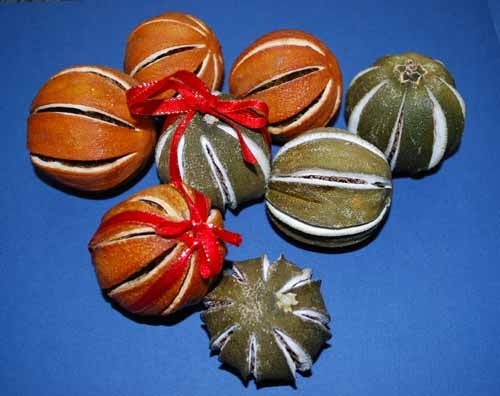 Christmas Citrus Baubles – how do you make them? This year’s fashionable Christmas decoration is dried citrus fruit – whole oranges and limes with slashed sides giving them a pretty striped pantaloon appearance. I tried to dry small clementines, but although they did eventually dry the results were miserable in comparison with the ones on sale – shrivelled and a dull brownish orange instead of nicely plump and well coloured. Does anyone know how to dry these fruits successfully and where are they are now made? How Long Will Frozen Apple Juice Keep? Does freezing apple juice make it as safe to drink as juice that has been pasteurized, and would it last as long as pasteurized juice once it has been brought back to fridge temperature?